Vinuth's son is a 6 days old infant, who is suffering from respiratory problem. Not even a moment after the birth of the baby boy, Vinuth and his family had to face the harsh truth of the newborn son, that if not given treatment faster, he may not recover faster. Vinuth’s son is a pre-mature baby. The infant is not only suffering from the respiratory disease but also two more diseases. According to the doctor, there is a problem of cleft palate because of that baby cannot feed milk and breath properly. Vinuth Prabhu works in a cyber centre, the baby’s grandfather Vishnu Prabhu is a car driver and baby’s uncle Vikram owns a small mobile shop. Vidya Prabhu is the infant’s grandmother and Vinuth’s wife Mrs Prabhu is a housewife. The family is struggling to support the 6 days old infant and keeping him alive. The family is in desperate needs of funds for the child. 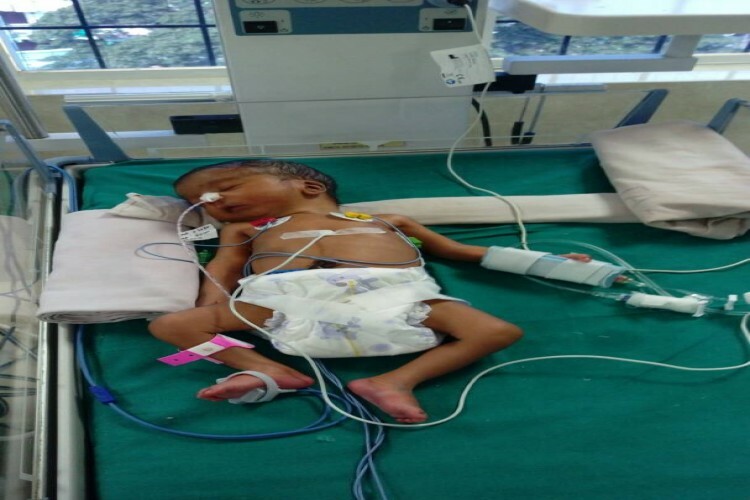 Help Vinuth by donating, so that the baby will be saved from this misery. Donate with a big heart and bless the child. Your share could be as good as a donation for bo suma! Not everyone can afford to take care of their loved ones. bo suma's life can only be saved by donations made by kind people like you.